Six of 12 sitting Texas district attorneys who faced 2018 primary challengers lost their races. Whether that’s normal turnover or part of a larger focus on criminal justice reform, several experts say it’s no longer safe to be an incumbent prosecutor. 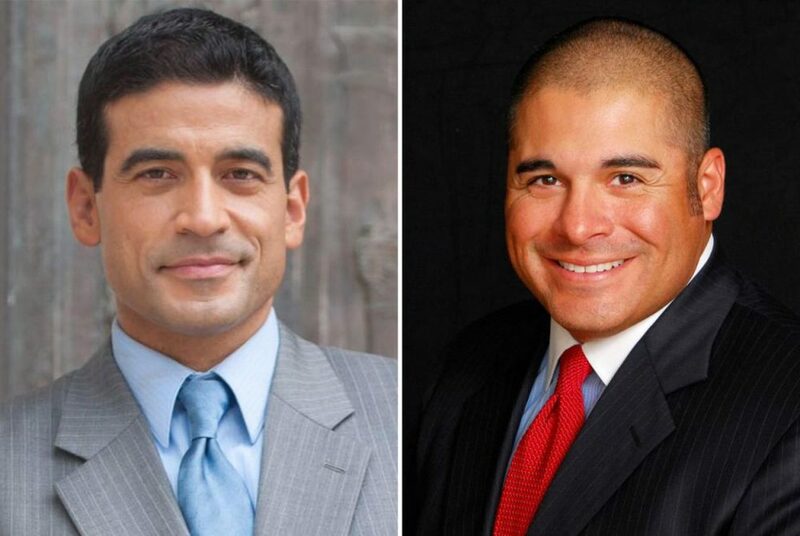 Bexar County District Attorney Nico LaHood (left) and McLennan County District Attorney Abel Reyna lost their 2018 primary races. In San Antonio, Bexar County’s Nico LaHood was voted out as district attorney Tuesday after one volatile term plagued by controversies over anti-Islamic remarks, public declarations that vaccines cause autism and alleged hostility toward colleagues and the press. His race ended with nearly $1 million of a liberal billionaire’s money being funneled to his opponent. McLennan County’s top prosecutor, Abel Reyna, was also ousted after eight years in office largely over his lock-them-all-up approach to the 2015 fatal Twin Peaks biker shooting in Waco. While their races faced unique circumstances, they weren’t alone in their disappointment in Texas’ primary elections. Six of the 12 sitting district attorneys who faced primary challengers lost their re-election bids last week, according to the Texas District and County Attorneys Association. Analysts disagree on whether this is a sign of criminal justice reform taking center stage in down-ballot races or just normal turnover. The 12 incumbents challenged in their primaries were a relatively small portion of about 50 Texas district attorney seats up for election this year. But several experts said that even the smaller number is indicative of a trend that district attorneys, who often would stay in office for decades, are no longer safe as incumbents. “Incumbency does not have the shield that it once did,” said Josh Marquis, a district attorney in Oregon since 1994 and board member of the National District Attorneys Association. Marquis said part of that weakened shield is because voters nationwide are becoming more informed about the power and choices of their local prosecutors, and on top of that is the relatively new threat of big money pouring into these races to fund more progressive, reform-minded candidates. Most notably, liberal billionaire George Soros has set his sights on transforming the American criminal justice system one local prosecutor at a time. His money largely funds candidates running on reformist issues, like reducing mass incarceration by diverting low-level drug offenders into treatment programs and addressing racial inequality. This year, Soros targeted Bexar County. The PAC tied to Soros gave almost $1 million to LaHood’s largely unknown opponent in the Democratic primary, Joe Gonzales. Gonzales has likened his opponent to President Donald Trump, according to the San Antonio Express-News. He beat LaHood by nearly 20 percentage points, and will now face Republican Tylden Shaeffer in November. LaHood — who defeated a 16-year incumbent in 2014 — said he lost primarily because of the negative campaign that came from the influx of Soros money. He thinks he was targeted because of his outspoken Christian faith and opposition to illegal immigration. Gov. Greg Abbott and Lt. Gov. Dan Patrick, both Republicans, also criticized Soros’ involvement in the race last week. Some reform advocates didn’t think money was the only factor in LaHood’s loss, though. Rob Smith, executive director of the Fair Punishment Project, said a flood of cash can move the needle in tight races, but that people in San Antonio were already upset with LaHood and engaging in the political process. For Republicans, McLennan County’s Reyna — who unseated a 20-year incumbent in 2010 — was ousted after two terms by a large margin after drawing harsh criticism for his handling of a fatal biker shooting at Twin Peaks. His office sought indictments for more than 150 bikers, and Reyna has so far dismissed or refused about a third of them, according to the Waco Tribune-Herald. He was defeated by Barry Johnson, who faces an independent challenger in the fall (the lone Democrat suspended his campaign last month). In Victoria County, three-term Republican District Attorney Steve Tyler — who tagged himself as “a prosecutor, not a politician” — lost to criminal defense lawyer Constance Filley Johnson, who faces no November opponent. Johnson campaigned largely on repealing Tyler’s policy requiring trials for all first DWI offenses. “What I take away from the results in the Republican district attorney primaries [Tuesday] evening is that voters want a district attorney who will define success by improving public safety and reducing recidivism, which in many cases involving nonviolent offenders means alternatives like a drug court rather than prison,” said Marc Levin, vice president of criminal justice policy for the Texas Public Policy Foundation, a conservative think tank. Levin said the recent election results are the continuation of a trend of voters electing reform-minded candidates, pointing to 2016 races in Williamson and Midland counties. But not all incumbents lost Tuesday to reformists. In Wichita County, the two-term Republican incumbent lost after her primary opponent said she was too reluctant to pursue the death penalty. And criminal justice reform didn’t appear to play a major role in Gregg and Harrison counties, where the other incumbents lost. The Texas District and County Attorneys Association doesn’t have historic data on losing incumbents, but its director of governmental relations, Shannon Edmonds, noted that despite reformist claims of momentum, turnover for district attorneys is constant. He said some more incumbents may lose in November, and if this election cycle resembles others, Texas should end up with about 12 to 15 new top prosecutors next year. Nick Hudson, a criminal justice policy analyst for the American Civil Liberties Union of Texas, said a trend toward less long-term officeholders and increased competition in either the primary or general is better for citizens. “When DA races go uncontested, it means there’s an entire generation who’ve never even had the opportunity to weigh in on who their next DA will be,” he said.